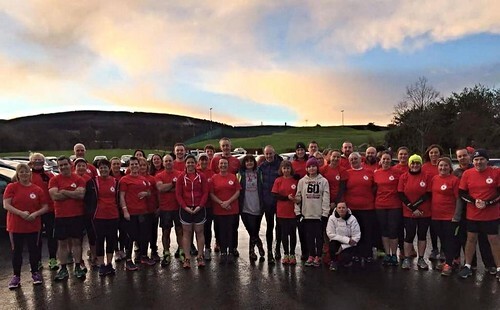 Welcome to the latest parkrun Ireland newsletter. Next week we once again welcome Operation Transformation to parkrun as Celeb OT kicks off with visits to Lough Key, Naas, Shanganagh and Ballincollig. The emphasis is on walking, you don’t need to run, and this is the message we always try to communicate. At parkrun, we welcome all abilities and in particular we love to see first timers looking to get active and become part of the parkrun community. All events, not just those with RTE visiting, will meet and greet you and make you feel welcome, so if you are one of those people who have registered for parkrun and haven’t managed a first visit yet then this is your best opportunity. We are hoping to see lots of first time walkers next Saturday, and maybe even the Irish weather will be welcoming! Were you a first-timer last weekend, did you run a personal best, or do you have any other feedback? We would love to hear from you so please get in touch. Whether you like listening to music whilst running, walking or doing cartwheels, we have a fantastic giveaway this month that you won’t want to miss! 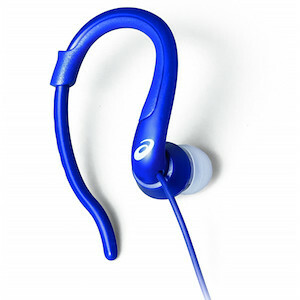 Intersport have teamed up with ASICS to offer parkrunners an exclusive FREE pair of ASICS headphones. All you need to do is pop down to your local Intersport store (find your nearest store here) and show us your parkrun barcode - #DFYB! The exclusive ASICS headphones are in store now and are free for all parkrunners whilst stocks last. They are limited edition so act fast to avoid disappointment…once they’re gone, they’re gone! Don’t forget, you can still claim 10% off* running products in store by showing your parkrun barcode – an excellent reason to have a quick browse while you’re picking up your headphones! We look forward to seeing you in your nearest Intersport soon, and in the meantime keep sending us your pictures via Twitter @IntersportIE #loveparkrun and like us on Facebook to keep up with what’s going on. * Not to be used in conjunction with any other offer or promotion. I completed my 10th parkrun recently and I’m totally addicted to it! It sets me up for the week. In my 63 years I never thought I would run one. 10 people came with me last week, with more to follow in the weeks ahead. I’m so delighted that there has been a parkrun in Falcarragh since January, and I go every week unless there's a very good reason not to. I even managed to run one in Cookstown one weekend when we were down. It really does set you up for the weekend, always pushing yourself that wee bit every week, meeting the same people and having a chat, and there's always lots of visitors. And thanks of course to the wonderful volunteers that make it possible. You can tell I do love my parkrun! It's been a while since I did parkrun. I had decided during the week that I was doing it this week no matter what. Got up and the weather was bad. I was planning a handy pace with the dog. He doesn't mind the weather, but when we were getting ready I could tell he was thinking ‘are you serious - are we really going for a run in this?’. We got there and if anything the weather was worse. Once you get going it all changes, all those thoughts of 'what the heck am I doing here', just disappear. Then when you are finished, it's not a sense of smug achievement, just a feeling of being healthy and having a good start to the day. What a great thing parkrun is! What do you do at parkrun? Every Saturday morning I don my apricot parkrun top and arrive in the picturesque Lough Key, where I meet the other enthusiastic members of Lough Key parkrun core team! We are truly lucky to have such a wonderful group of volunteers who make parkrun happen, including my 15-year-old sister-in-law Saoirse Roddy who is only one week away from earning her 25 Club volunteer shirt. Well done Saoirse! Once I've run I always hang around at the finish funnel to cheer on every single parkrunner, I get so enthusiastic sometimes I actually jump around! 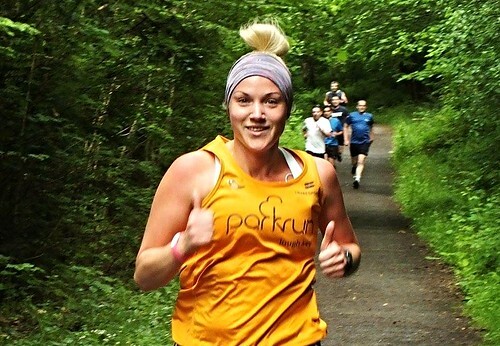 How has parkrun changed your running? parkrun has changed my running to no end, I have gone from a time of 30:07 to a wonderful 24:46. Without the support of parkrun and its runners, volunteers and everything it embraces, I would not be running today. It has changed my life, not just my running. I am so happy to have been introduced to the fabulous world of parkrun and hope to achieve my 50 Club membership by this Christmas! What do you like about parkrun? The sense of satisfaction you feel when you know you have made the effort to get up on a Saturday morning, run 5k and do it in such a welcoming a supportive atmosphere with no pressure. Since being introduced to parkrun in October 2014 by my parkrun fanatic sister who is a regular Roundhay parkrun attendee, I have managed to introduce my sister and mother-in-law, brother and many work colleagues, who have also never looked back! Deirdre Parnell our report writer once wrote: "Lovely Melissa Doohan who embodies the spirit of parkrun." Most memorable or funniest parkrun moment: The day I finally achieved my New Year's Resolution/target to achieve a sub-25 parkrun by Easter 2016 with only one day to spare! I achieved this as a parkrun tourist in the beautiful Woodhouse Moor parkrun while on a visit to Leeds; with the much needed support of my sister Alexandra Watson Usher, the person responsible for my parkrun addiction. There were no words to describe the feeling I got when I crossed that finish line with the timekeepers cheering me on, knowing that I had finally reached my target with one day left until Easter!